Think back to your growing up years, was there a special boy you had a crush on? One who always seemed to be getting into trouble yet could turn around and give you a smile to make you melt? Elisabeth knew one such young man, and she should have ended up getting married to him except he disappeared. Which would you rather do, take him back with kisses or slug him? Elisabeth chose to use her fists, a true sense of her character peeking out in that moment. She is feisty and stubborn even though she may not have any hidden magic or secret talents. Seems she is just perfect for a certain bad boy named Brendan. Brendan has really dug himself a hole and inadvertently taken Elisabeth down with him. Even though he has made some poor choices he is still fighting to repair the damage and is willing to put himself on the line for Elisabeth. Now that screams deep feelings, even if he can’t bring himself to say the words. It is his feelings for her that make all the difference, even when you have given up hope. 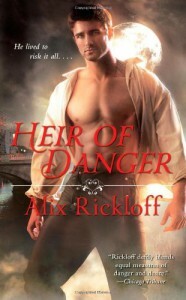 Heir of Danger brings the fey to England, both the light and dark courts. Rickloff has given the legends a nice spin with beings that seem to be descendants of the fey and other mythical type beings, Killer being one bright star in the story. Killer is a fur ball of a dog who takes it upon himself to shadow Elisabeth and make faces at her, just enough to make you wonder if there is more to this four legged friend. It is fun to see Elisabeth, who is almost a regular human, handle being thrown into situations that have the potential to end in war. Lucky for Brendan she doesn’t always hold her tongue! A fresh take on Regency England and a great paranormal novel. Not only that but there is also a great romance involved, a jilted bride abducted by her ex-fiancé. Both fighting their attraction and unsure if they are falling in love or just want to take out some aggression on each other. If you enjoy anything fey you do not want to miss this series!